360 NW ENTERPRISE DR – Asset Specialists, Inc.
Price/SF $88.89 Clear Ceiling Height 24 ft.
360 NW ENTERPRISE DRIVE is a ±30,000 Square Foot Free Standing Warehouse / Office Building situated on a 2.00± acre lot with a secured paved yard area. The property is in a prime Industrial District of Port St. Lucie, Florida and is within the master-planned community of St. Lucie West which is comprised of 6,000 families, more than 200 ongoing businesses and numerous shopping, dining and entertainment options. This property offers investors an opportunity to purchase a 100% Net Net Leased Investment Property with a credible tenant, SCP Distributors LLC which is a division of POOLCORP (NASDAQ: POOL), in place and upside opportunity through annual rent escalations and continued growth and demand projected in the market. The 360 NW Enterprise Drive Warehouse Building is located near the corner of NW Enterprise Drive and NW Peacock Boulevard across from Tradition Field. 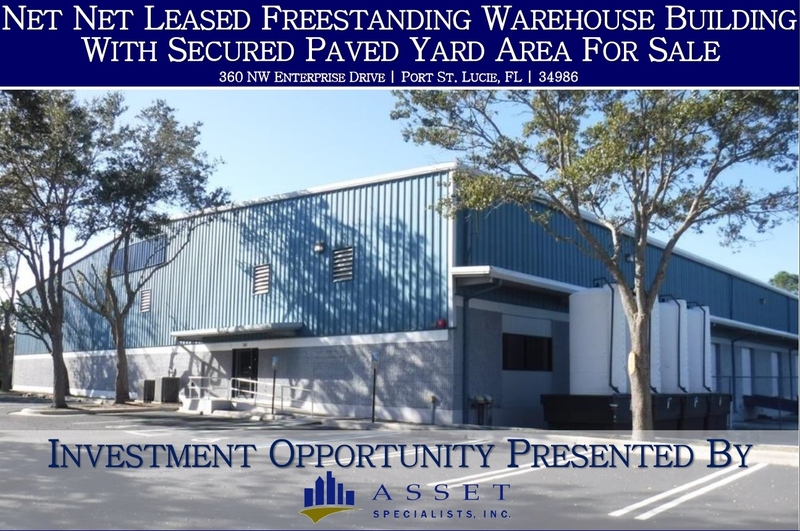 This facility is in the heart of St. Lucie West, minutes away from shopping, banking, restaurants and employment centers with easy access to I-95 and Florida’ s Turnpike.